NEW YORK — The NFL Players Association filed a grievance with the league on Tuesday challenging its national anthem policy. Nate Boyer weighs in on a policy change nearly two years in the making. In 2016, then-49ers quarterback, Colin Kaepernick began protesting police brutality and social injustice by kneeling during the national anthem, and the demonstration spread to other players and teams. 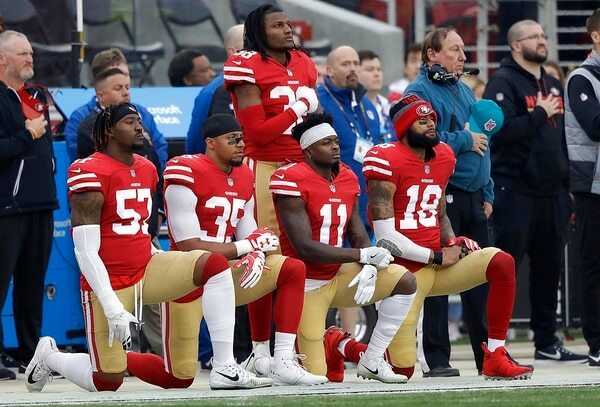 It became one of the most controversial and sensitive issues in the NFL, with players saying their messages last year were being misconstrued, while others — including President Donald Trump — called them unpatriotic. Trump even said NFL owners should fire any player who refused to stand during the anthem. “We’re here for a bigger platform,” Raiders tight end Jared Cook said during the spring. “We’re not just athletes. We’re people that live this. It’s people in our neighborhood, it’s people that we grew up with, it’s people that we know who are actually living through these circumstances. So when we speak on it, it’s not like we’re just speaking out of the side of our neck. It’s things that actually touch home and things that we can actually relate to. Polls describing the NFL's dismal ratings are going far deeper than asking respondents to describe why they are boycotting the league.